It's certainly been a mixed-up summer this year. The weather has been upside-down for most of the time, and my life here has been matching that ... I wasn't able to take the girls up to the mountains for a vacation, and the three of us had to stay here in our Tokyo apartment. It's been years since I've stayed here all through August ... and I don't like it! This issue's main feature though, isn't a summer story, but one that I prepared last January. I made a visit to the people who prepare the mulberry each winter for papermaking, and I hope you find the photos and description of the process interesting. We'll also see what possible connection Tanzania and Kenya could have with traditional woodblock printmaking, and we're almost at the end of the '... origin of the project ...' column. The new year started in an interesting way for me, with my first exhibition. Having a public display of my work was something that I had not been considering at all, and had imagined that I would not be doing such things until quite some years down the road. But a group of ladies running a local newspaper and culture center (where I had been teaching English one evening a week) called me one day and announced that it was all organized - a six day showing in a local 'free space'! I had a bit of a difficult time getting used to the idea - exhibitions are for 'artists', aren't they? - but went along with it, and prepared displays and descriptions of my prints. It turned out to be a frantic week; my wife went off to Sendai for six days to visit friends, the girls were still in day care, and of course I had dozens of English classes to teach. About 90 or so people came through, three of whom became subscribers, and for the first time I had the experience of watching people discover my work. I decided right then, that the exhibition would become an annual event, to be repeated every January, building up ten-by-ten until the full set of 100 was finished. Although there were only nine prints finished in time for this first exhibition, since then I have managed to finish each year 'in time' to display the newest set of ten. With the collector list growing this way, slowly but steadily, I started to get in trouble with the work load. There was no way I could focus my attention on the printmaking itself with all the 'extra' work of record-keeping, packaging, wrapping and shipping also waiting to be done, so Mrs. Miyoko Ashida, the mother of one of my English students, agreed to work for me part-time, to do all these ancillary jobs. I felt a bit strange about this - I still couldn't afford to even pay the rent with printmaking, and here I had an employee! She worked wonderfully on this for three years, and only just recently left to get a 'real' job. The world of woodblock prints - and the world of coffee. Would it be possible to find two more disparate topics? Well, I wouldn't have thought so, but I have learned that they are not so far apart as you might think ... I had the opportunity a while ago to meet Waki Karube and his wife Hisayo-san, proprietors of the 'Cafe de BJ' in Kumagaya City, and who taught me that making coffee and making woodblock prints are actually pretty similar occupations. I'm not much of a coffee drinker, and I guess Waki-san must have realized this the first time I visited BJ. When he asked me, "What would you like - Tanzania, Kenya ...? ", I just stared back at him blankly. But to him, and to many of his customers, it makes a difference. He starts with raw beans, imported from top coffee producing areas around the world, selects them and then carefully roasts them by hand in the kitchen of their apartment upstairs, carefully watching for just the right colour, listening for just the right 'crackle', and of course sniffing for just the right aroma. He does this in very small amounts, just enough for a couple of day's supply at a time. After roasting, he carefully goes through the pile, checking every bean, and throws out all substandard ones that might affect the taste. The roast beans are then sealed in jars and only ground when you order your cup. He controls everything: the temperature of the water before heating, the material of the drip device, the exact way the water is poured over the ground coffee, the china selection ... Coffee just doesn't come any fresher and tastier than this. And the customers know it ... or are learning it. BJ is gaining a reputation as a place for the connoisseur of coffee. Hisayo and Waki are not interested in 'gulp-it-down' customers, and is even considering stopping service of their wonderful spaghetti lunches (with a fantastic handmade sauce ...). He complained to me that everybody says, "Tasty spaghetti!" But if I make them sound too strict, that is misleading. They are interested in the same thing that I am - to gather the best materials you can find, use the best tools available, and exercise your best skills ... to make the best product you can. And then to talk about it while you are doing it - in order not only that you reach the highest standard yourself, but so that you bring everybody else up with you. To teach them just what good coffee is ... or just what a good woodblock print involves. I should have realized that this visit would be different from the typical 'Visit to a craftsman ...' when Souma-san phoned me up to ask when I would be coming .... a strong, assertive voice with machine-gun delivery. I was being somewhat hesitant about making the trip to see him; it was a long way to go, I was very busy, and right now I really couldn't spare either the time or money that it would cost me to get over to the far end of Ibaragi Prefecture. He was audibly disgusted with my hesitation. "Well, are you coming ....?" He obviously wanted to get this thing organized, and get back to his work. I made my decision to head over there, and we made the arrangements, but when I hung up the telephone I shook my head in wonderment ... this just didn't sound like the kind of person who would ever have the patience to sit there for hours at a time peeling the bark from steamed mulberry branches in order to provide Yamaguchi-san with the raw material for his paper-making work. What would I find when I got there ...? I left the house at 5:15 in the morning, and five trains and five hours later I alighted at Fukuroda station on the Suigun line running north from Mito City. Souma-san in person was just like Souma-san on the telephone. Brisk, and 'no-nonsense'. A man in a hurry. "Grab your camera. Let's go." And for the next four hours or so, we 'went' ... non-stop. I got the 'grand tour' of his whole operation - from fields to finished bales. Of course he's got no patience, he's not a craftsman, he's a businessman! Actually, there is a reason for all the hurry, and that is the seasonal nature of the process. There's only a short 'window' during which this work can be done. Cutting the branches off the mulberry trees starts right after New Year, and continues for only about two months. 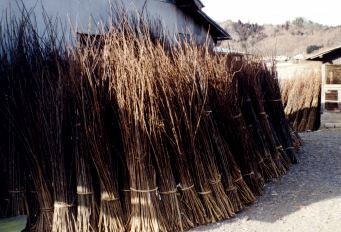 After harvesting, the branches are trimmed to length (about 70cm), bundled together, and steamed for about two hours. 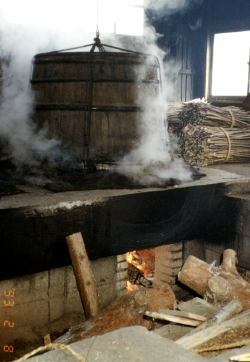 As the softened branches come from the steamer, a group of workers quickly detach the outer bark from the wood. 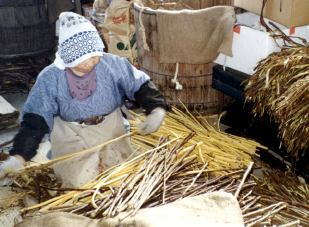 This is done by hand with a quick twist on the end of each stick to release the bark, and then a sharp tug to strip it off. 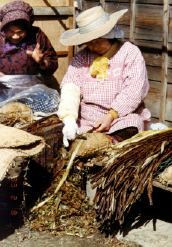 The wood itself is not needed and is sold for use in making the strips that bind traditional wooden buckets. 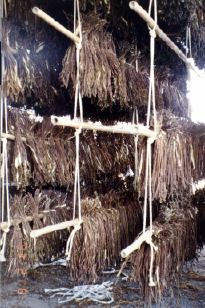 A large open barn nearby is jammed with rack after rack of bundles of the stripped bark, waiting to be taken up to farmhouses in the nearby mountains, where the most labour-intensive step takes place, separation of the unwanted dark outer bark from the white inner kozo fibers. Souma-san drove me up there to show me the process. This was more like what I had expected to see. An ancient, weather-beaten old country house. Of course a huge thatched roof. And under the eaves outside, protected from the cold wind but exposed to the winter sun, a wide bench with four 'work stations' where a trio of grandparents sat working. 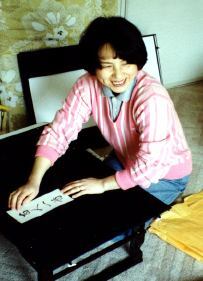 They do this on a piecework basis for Souma-san every winter, and have obviously been at it for many years. There's no 'go go go' tension up here, and I'm sure the three of them (one was off for the day) expended far more calories in laughter at their companions' remarks than in actual work. They get it done though, and the row of fat bundles of cleaned kozo drying on a bamboo pole testified to how early this morning they must have started. I'm not quite ready for it yet, but when it's my turn to be 80-odd years old, I don't think I'd be able to find a more congenial way to pass the time than to sit in the sun with a group of friends, doing a productive job like this ... one that nobody else wants to do, but yet which is absolutely necessary for the process of making beautiful woodblock prints. 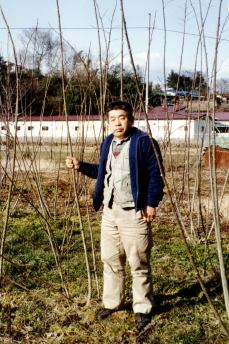 Souma-san is the third generation of his family working with 'kozo' in this valley, one of the most famous places in the country for mulberry production. His grandfather moved here from Fukui Prefecture, and Souma-san still has relatives living back there, quite near to the paper maker Yamaguchi-san. 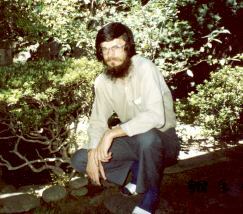 He ships his product to paper-makers in many areas of Japan, and he ships a lot of it. 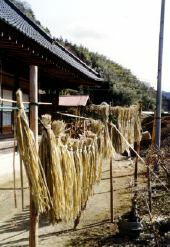 Handmade paper may not exactly be a 'growth industry' these days, but it is a very important part of Japanese life, and there is good demand for quality kozo. The major problem facing Souma-san is finding workers willing to take on such labour-intensive work, even on a seasonal basis. As the population in this rural area drops steadily year by year, finding workers gets ever more difficult. He dropped me back at the station in mid-afternoon, and the same five trains (but about six hours this time) got me back home again, just in time to see my daughters before they went to bed. They'd been quite excited about the idea of spending the whole day by themselves, right from breakfast to bedtime, but had had no problems. And in case anyone has any doubts as to whether my kids have really become Japanese or not, they thought the 'yaki mochi' was just about the best present I could have brought home for them! I'll make it as simple as possible. Michiyo and I were divorced in early August. I am continuing to live here in Hamura with the girls, but she has left to make a new life in Canada. A couple of years ago, when we first started those long separations so she could attend university in Canada, a number of our friends suggested that it might cause trouble 'down the line', and it seems they were right. I have no desire to get into the soap opera details here, but will simply say that during the last year at school Michiyo found herself attracted to one of her tutors, and there was a breakdown in our personal relationship. During our discussions this summer she was faced with two choices - one, to remain in Japan, find something interesting to study or work at and try and pick up life again with her family and husband; or two, to return to Canada to continue her activities there. For her, both choices were horrible: staying in Japan meant giving up her dream of entering medical school, but returning to Canada meant losing her family, because it was impossible for me under the circumstances to continue to support her. She chose Canada. When she headed for the airport, I went to City Hall and got the divorce. Anyway, enough of this stuff. My life may not be exactly 'rosy' and cheerful at the moment, but things are not all that bad. Bit by bit I'm gradually getting the bitter taste of this whole affair out of my mouth, and starting to try and look forward again to ... whatever is coming up! Just about the time you will be receiving the next issue of this newsletter, I will be finishing up print number 50 in the series. Of course, getting to the halfway point will be a big milestone for me, and I am thinking of making the next newsletter a kind of 'Special Issue' to mark the event.